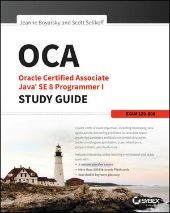 I plan on giving the OCA exam soon, and thanks to coderanch I had gained enough information and decided to get the Sybex book. Today while surfing I came across the Oracle Press book as well, could someone compare those books? Or give some information so that it is easy to decide which book I should buy. Sheeda Moti wrote: Today while surfing I came across the Oracle Press book as well, could someone compare those books? Or give some information so that it is easy to decide which book I should buy. I didn't read these study guides, so the only advice I can give is to have a look at the Amazon ratings and reviews. It will probably give you some idea about the books. On Amazon you have also the Look Inside feature, so just read a few pages to see if you like the book (writing style, code snippets,...). The publisher of the book often provides on their website a free chapter which you can read to have a better idea of the study guide. So I suggest reading those as well. It will give you an idea about the writing style, the quality (do you encounter only a few typos or also important technical mistakes), the level of mock questions (if available), and so on. Here you'll find the Sybex webpage (click on "Read an Excerpt") and here is the one for Oracle Press (but it seems there's no link to access/read a free chapter). In my personal opinion, it's very important for technical books and study guides to have a publicly available errata overview as well. The official errata overview for the Sybex study guide can be found here, I don't know if the Oracle Press study guide currently has such an overview. And finally you could of course purchase both study guides as well. You could use one as your main study guide and use the other one as a complementary study guide.